Not to be confused with sign. The function sine can be traced to the jyā and koṭi-jyā functions used in Gupta period Indian astronomy (Aryabhatiya, Surya Siddhanta), via translation from Sanskrit to Arabic and then from Arabic to Latin. The word "sine" comes from a Latin mistranslation of the Arabic jiba, which is a transliteration of the Sanskrit word for half the chord, jya-ardha. As stated, the value sin(α) appears to depend on the choice of right triangle containing an angle of measure α. However, this is not the case: all such triangles are similar, and so the ratio is the same for each of them. The trigonometric functions can be defined in terms of the rise, run, and slope of a line segment relative to some horizontal line. When the length of the line segment is 1, sine takes an angle and tells the rise. Sine takes an angle and tells the rise per unit length of the line segment. 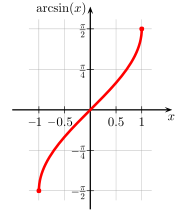 Rise is equal to sin θ multiplied by the length of the line segment. 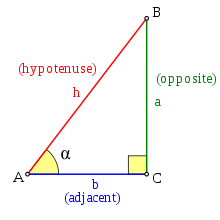 In contrast, cosine is used for telling the run from the angle; and tangent is used for telling the slope from the angle. Arctan is used for telling the angle from the slope. The line segment is the equivalent of the hypotenuse in the right-triangle, and when it has a length of 1 it is also equivalent to the radius of the unit circle. 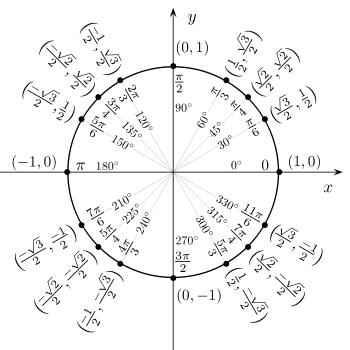 Illustration of a unit circle. The radius has a length of 1. The variable t is an angle measure. Let a line through the origin, making an angle of θ with the positive half of the x-axis, intersect the unit circle. The x- and y-coordinates of this point of intersection are equal to cos θ and sin(θ), respectively. The point's distance from the origin is always 1. 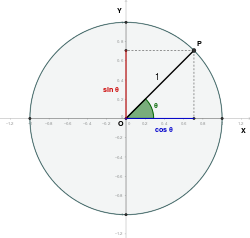 Animation showing how the sine function (in red) is graphed from the y-coordinate (red dot) of a point on the unit circle (in green) at an angle of θ in radians. These apply for all values of . 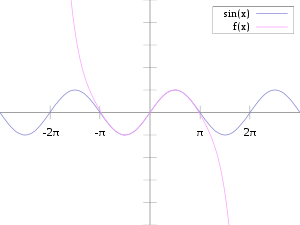 The sine and cosine functions are related in multiple ways. The two functions are out of phase by 90°: = for all angles x. Also, the derivative of the function sin(x) is cos(x). Over the four quadrants of the sine function is as follows. Points between the quadrants. k is an integer. The quadrants of the unit circle and of sin x, using the Cartesian coordinate system. For arguments outside those in the table, get the value using the fact the sine function has a period of 360° (or 2π rad): , or use . Or use and . For complement of sine, we have . This animation shows how including more and more terms in the partial sum of its Taylor series gradually builds up a sine curve. The continued fraction representation expresses the real number values, both rational and irrational, of the sine function. The fixed point iteration xn+1 = sin xn with initial value x0 = 2 converges to 0. The arc length of the sine curve between and is This integral is an elliptic integral of the second kind. The arc length for a full period is where is the Gamma function. Some common angles (θ) shown on the unit circle. The angles are given in degrees and radians, together with the corresponding intersection point on the unit circle, (cos θ, sin θ). 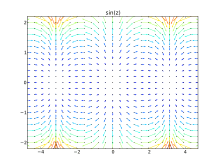 Domain coloring of sin(z) over (-π,π) on x and y axes. Brightness indicates absolute magnitude, saturation represents complex argument. both converge and are equal to . Etymologically, the word sine derives from the Sanskrit word for chord, jiva*(jya being its more popular synonym). This was transliterated in Arabic as jiba جــيــب, abbreviated jb جــــب . Since Arabic is written without short vowels, "jb" was interpreted as the word jaib جــيــب, which means "bosom", when the Arabic text was translated in the 12th century into Latin by Gerard of Cremona. The translator used the Latin equivalent for "bosom", sinus (which means "bosom" or "bay" or "fold"). The English form sine was introduced in the 1590s. 1 2 Uta C. Merzbach, Carl B. Boyer (2011), A History of Mathematics, Hoboken, N.J.: John Wiley & Sons, 3rd ed., p. 189. ↑ Victor J. Katz (2008), A History of Mathematics, Boston: Addison-Wesley, 3rd. ed., p. 253, sidebar 8.1. ↑ See Merzbach, Boyer (2011). ↑ Eli Maor (1998), Trigonometric Delights, Princeton: Princeton University Press, p. 35-36.